Sardinia is a Corker! ~ Sardinia Baby! The SS127 spirals up through lush, beautiful Cork Oak foliage in the direction of Tempio Pausania in the north east. Who would have guessed that these beautiful trees are part of a europe wide multi million euro industry. 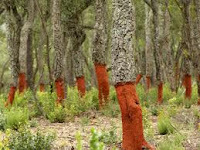 Sardinian Cork (Sughero) trees are still stripped of their precious natural material entirely without machinery and appear almost naked from the waist down. Cork Oak can live for up to 250 years and Virgin cork, or 'male' cork, is the first cork cut from trees approximately twenty-five years old. Another ten to fifteen years maturing is required for the second harvest and a tree can be harvested up to a dozen times in its life. Holiday makers in Sardinia can buy any number of tacky Cork fashioned trinkets. The Sughero industry in Europe produces a staggering 340,000 tones of cork a year, fifty percent of which comes from Portugal. It’s estimated value is a whapping 1.5 billion euros with a work force of 30,000 people. 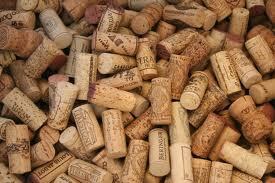 Wine corks constitute 15% of cork usage by weight but 66% of revenues. This means that 51,000 tons of cork goes towards bottling our wine at a cost of 99 million euros! I check for bandits, get out of my 'Punto' and nick some cork. I’m in the wrong business!